Dame Marie Bashir was in our lift yesterday and I saw her put her arms around an aboriginal woman. She said, “Every time I see an aboriginal sister, I just want to say, ‘Thank you, thank you, thank you.” Dame Marie was here for our celebrations to mark NAIDOC Week. There were few happier places on earth than Wayside yesterday. 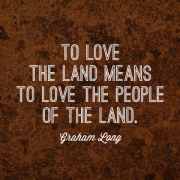 We were able to peer into a future Australia that will enter into it’s own maturity because it knows that to love the land means to love the people of the land. A homeless woman rushed through our front door the other day to say that someone had set fire to another homeless person’s mattress. There is a mattress set up near the theatre right behind us. We were about to rush to the fire and the lady said, “Don’t rush, I put the fire out.” She went on to explain that she’d poured all of her wine over the fire. I’m not sure if she was expecting we’d replace her supply of plonk or perhaps nominate her for an Order of Australia.